Did you know that the first commercial grape vines, that are still in use today in Walla Walla, Washington was by the Leonetti family in 1974? There were some vines planted in the 1950s by others but a deep freeze in 1956 killed all the vines. The Leonetti family purchased 1.5 acres, which also contained a house and a shed, which could be used for the winery. The winery officially started in 1977. A few hundred cuttings of Cabernet Sauvignon and Riesling bare root grapes were planted by the parents of the current owner, Chris Figgins. Chris’ parents sacrificed to bring the winery on the path to success. Chris’ mother would babysit and clean houses, while his father, was a machinist working at Continental Can. He would save all his vacation days for October each year for harvest and vinification of their wine. As a machinist he had an eye for detail, which followed in his process to make good wine. This attention to detail has continued with Chris Figgins, and his sister and business partner, Amy. 2017 is a special year for Chris and Amy, as it is the 40th year of operation for the family winery. The Tulalip Resort Casino has their very successful “Taste of Tulalip” that they hold every November. The Taste of Tulalip starts with a multi-course wine and food paired dinner on Friday, followed by wine tastings and an amazing Magnum party on the weekend. The Resort is able to work with many WA wineries to bring their best wines for everyone to taste and enjoy. The Resort currently is renovating their rooms, so decided to hold off on the next Taste of Tulalip for one year. But in the meantime, they are offering smaller, special wine tastings and other events throughout the year. 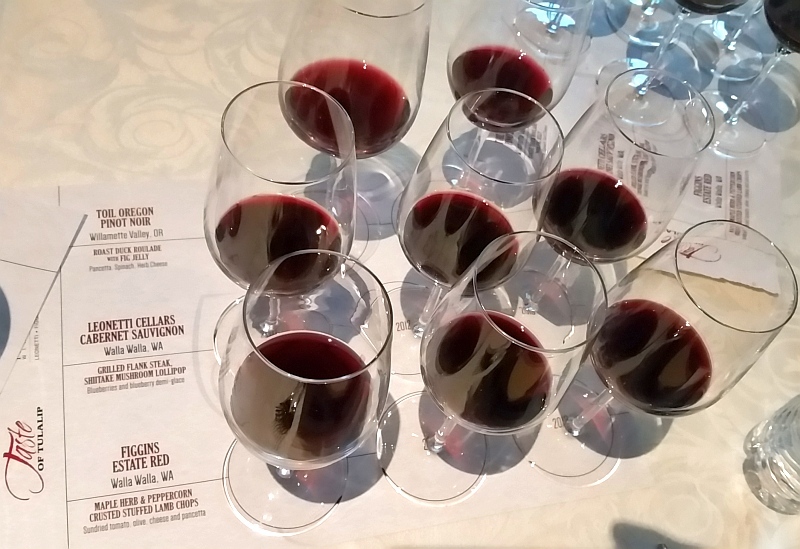 I was invited to come to the resort to stay in one of the renovated rooms, to attend a winery seminar by Chris Figgins from Leonetti Cellar, enjoy dinner at Tulalip Bay, and relax at the spa. The seminar by Leonetti Cellar is quite special as you cannot buy Leonetti wines in your local bottle shop, or visit their tasting room, as Leonetti does not have a tasting room, and they only sell their wines through their Wine Club, which has a long waiting list. They are most well-known for their flagship red Bordeaux blend, as well as their other wines; a Cabernet Sauvignon, Merlot, and Sangiovese. You may notice that of these 3 verticals, only one is labelled Leonetti Cellar. Figgins Estate is a parallel winery that Chris started that creates wine from a single vineyard in the Walla Walla area, and is named after the Figgins side of his family. The other wine label is named Toil, which is named after the hard work by the family over a long time. Pinot Noir is an obsession for many wine makers, and this is the case for Chris. A very unforgiving grape in the vineyard and in vinification. Before tasting these wines and trying them with paired dishes, Chris covered his family’s history in the Walla Walla area, followed by the geological history of the region that made Walla Walla produce exceptional grapes. To sum up, in the last ice age northern Washington was covered in 1000 ft of ice. As the ice melted and retreated there was rafting of granite stones to Walla Walla from 100s of miles away. There was also a series of ice dams that formed, building huge lakes. The dams eventually burst, flowing across eastern Washington to make the channel scab lands. The flood waters went up to 1200 ft in Walla Walla. The flood water picked up lots of sediment, which precipitated out when the water slowed. The sediment is made of ground up granite. Every 50-100 years there would be a cycle of dam creation and bursting, which created 5-6 ft deep layers of sediment. Today in the valley the soil is dry and like talcum powder, with low clay content. When wet the soil is friable. Grape vines like low clay and friable soils. The vineyards in the Walla Walla area consist of these sediments overlain over basalt. Leonetti Cellar owns their vineyards and does not need to purchase grapes from contractors. They have complete control over the vines and the soil. Two of the major vineyards I noted from the seminar is the 7 Hills Vineyard, which is their main vineyard. It is produces Cabernet Sauvignon grapes that are feminine, which Chris describes are red fruited, pretty, low acid, soft & dusty tannins, and a umami character. The other major vineyard for them is the Loess Vineyard, which produces Cabernet Sauvignon grapes that are more masculine, brawny, with bigger tannins, blue and black fruits, and higher acidity. For Chris, soil is very important, and to make the soils the best they can be for grape production, they compost most materials in the vineyard and winery, and produce compost teas. Chris noted that the soils that produce the most aromatics in grapes are ones that have a high fungal content. Low production soils, e.g. ones that were commercially farmed with herbicides, pesticides and fertilizers, “dead” soils that have a large bacterial component. Changing the soils from bacterial to fungal is Chris’ goal. It certainly appears to work as Chris’ wines are very aromatic and flavourful. The 2011, 2012 and 2013 vintages were poured for us to try. They represented a cool, warm, and a hot vintage, in that order. A cool vintage in the past for Cabernet Sauvignon, can produce a very herbaceous wine, but Chris noted that with their viticultural practices, using compost and teas, making the soils more fungal, did not as adversely affect the grapes. The wine from the 2011 vintage was very elegant, and the closest he has made to a Bordeaux style wine in Walla Walla according to Chris. 2012 was an “easy” vintage as the average temperature and rainfall throughout the growing season and harvest was perfect. 2013 was a hot year and it took more effort to keep the alcohol in check; picking dates was very critical in this vintage. Leonetti Cellar Cabernet Sauvignon 2011 – Deep garnet colour in the glass. Medium plus intensity with dark fruits and cedar. Fuller body, salty minerality and light mouth feel. Round with dark fruit flavours and some dark chocolate. Medium tannins. Leonetti Cellar Cabernet Sauvignon 2012 – Inky dark garnet colour. Cedar, vanilla and dark sweet fruit on the nose. Medium plus body; mineral with ripe, dark sweet fruit and nutmeg. Firm, yet fine tannins. Leonetti Cellar Cabernet Sauvignon 2013 – Opaque garnet in colour. Closed nose, but I did detect dark fruits, cedar and violet aromas. Fuller body, with ripe, dark sweet fruit, flowers, red cherries and oak in support. Some minerality and vanilla as well. This wine may be off-dry, or just very fruity due to the hot vintage. Figgins Estate Red 2011 – Opaque garnet. Medium minus intensity, of dark fruits and cedar. Fuller body, round and soft, with salty minerality. Raspberries and quite peppery. Firm tannins. A quality wine. Figgins Estate Red 2012 – Inky garnet colour; solid to the core. Closed nose, with hints of dark fruit. Fuller body, dusty and chalky, with dark fruit flavours. Firm tannins and a peppery finish. A very interesting wine. 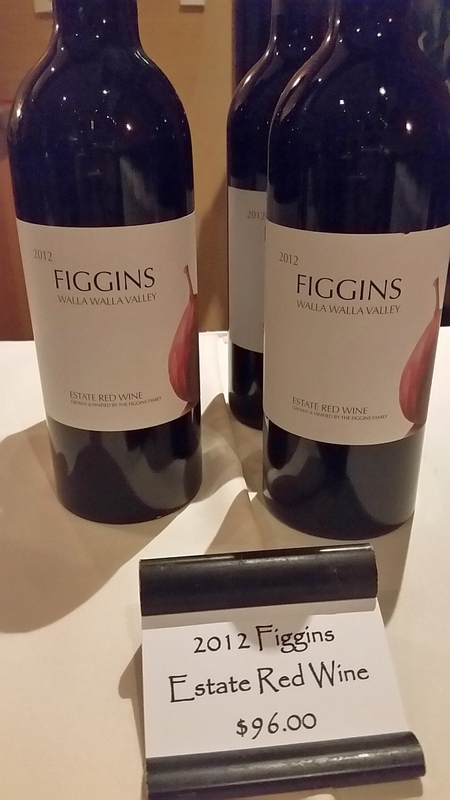 Figgins Estate Red 2013 – Opaque garnet. Deep, dark, ripe black fruit and oak on the nose. Full body, round and dry, with medium tannins. Silky mouth feel. Dark fruit flavour. Light nutmeg that builds to a peppery finish. A very masculine wine. Toil Oregon Pinot Noir 2014 – Medium garnet. Red cherries, band-aid and dustiness on the nose. Dry, with medium minus body. Silky. Dusty red cherries, light pepper, more band-aid and a hint of mineral. With air, the wine shows floral and cranberries. Thank you to Chris Figgins for offering this seminar and for the Tulalip Resort Casino for hosting it. It was very interesting, informative, and tasty. 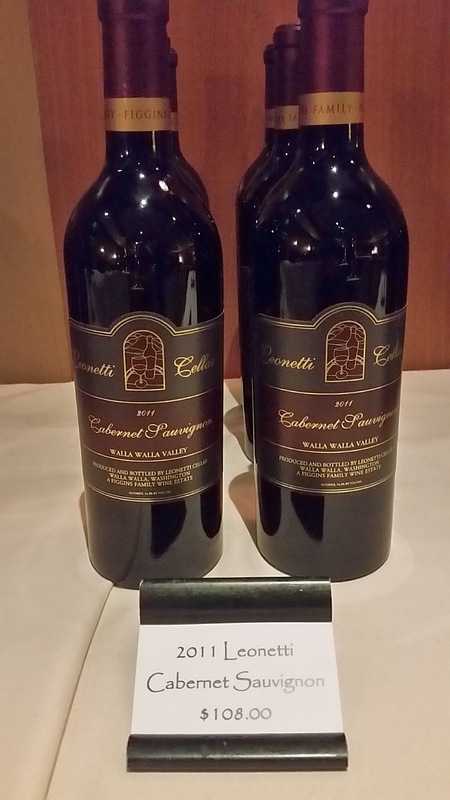 You can read about my wine and food paired dinner at Tulalip Bay restaurant at this link.